Dreaming of Kurobuta? Have some here! It was two in the afternoon on a weekday, yet Yabu was still full of diners. Surprising since the lunch rush was supposed to be over already, but we’re told that it’s always like this at Yabu. Honestly though, after tasting the food, it’s easy to understand why a lot of diners are raving about this katsu-centric restaurant. It was almost four pm when we left; the only time the diners thinned out. 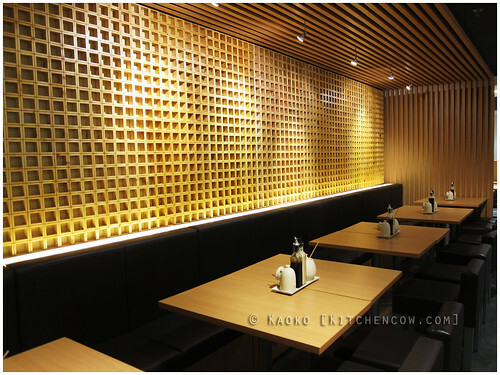 Patterned after Japanese katsuyas, or restaurants that focus solely on katsu, Yabu is a local restaurant born of a partnership between a Pinoy owner and Chef Kazuya Takeda, a Japanese chef who runs the popular Tonkatsu Takeshin restaurant in Tokyo. True enough, you can’t expect to find tempura, sushi and sashimi here. The only thing they serve is katsu, katsu, katsu. But before you worry about variety, Yabu offers a varied selection of katsu dishes that you’ll have a hard time deciding what to eat. 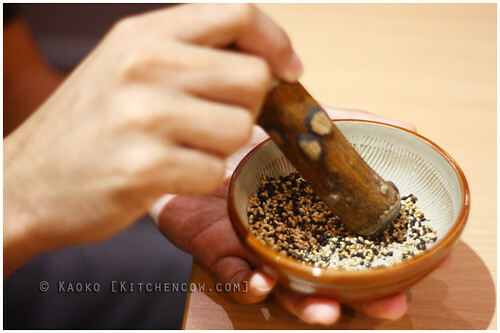 Grinding the sesame for the tonkatsu sauce. We started off with some appetizers. A big mistake, considering what was to come, but we were hungry so we thought we could handle it. At Yabu, appetizers come in sets of two. 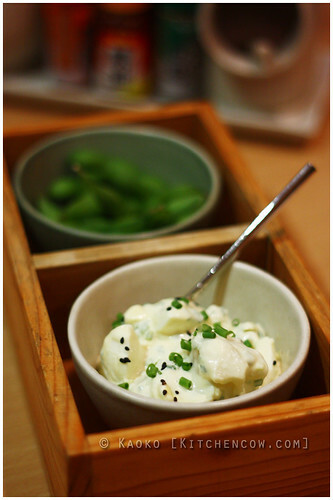 You can choose from edamame, hiyayakko tofu, wakame salad and Japanese-style potato salad. We opted for the potato salad and the edamame, sprinkled generously with himalayan pink sea salt from the tabletop salt cellar. The potato salad was as good as the better Japanese potato salads I’ve tried. Rich, creamy, and studded with fluffy potatoes and bits of egg. A sprinkling of black sesame and green onions finish it off. 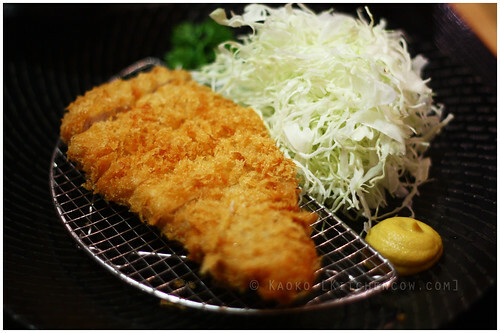 Yabu has two kinds of tonkatsu. Imported kurobuta, the black pig that’s touted as the wagyu of pork, and a 3/4-inch thick local variety that’s delivered fresh, not frozen, everyday. The local variety is available as rosu (pork loin) or hire (pork tenderloin). The main difference is the rosu has a trimming of fat, while the hire is lean. For my entree, I opted for the kurobuta tonkatsu. While the curry katsu was really tempting, I figured the best way to judge the quality of their tonkatsu was by trying the simplest preparation. I’m no stranger to kurobuta (I’ve had the chance to enjoy kurobuta tonkatsu dishes before), but still, Yabu’s kurobuta is a pleasant surprise. While some of the katsu I’ve tried are more flavorful, most likely due to the fat content, Yabu’s is the most tender cut I’ve tried. The pillowy softness is a great foil to the crisp panko crust, which is notably clean tasting with no greasiness at all. In another attempt to offer more choices, Yabu has two kinds of katsudon. The original katsudon takes on the traditional approach to this popular sauced fried cutlet dish. 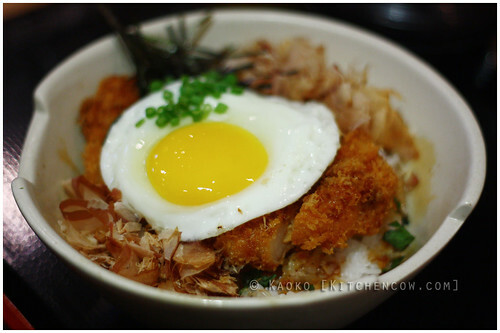 Their other katsudon is the Yabu Special Katsudon, an original recipe from katsu master Kazuya. Available only at Yabu and at his katsu restaurant in Tokyo, this special katsudon relies on a light and sweet, thickened miso-based glaze, then topped with shredded nori, bonito flakes, shiso and a fried egg. The egg is done overeasy, so poking through it gives you rich earthiness. The shiso adds a refreshing, minty bite, while the bonito and nori add a light saltiness that rounds out the whole dish. Or at least that’s what Pad was saying, as he was waxing poetic about his food. Sold as sets, both dishes are served with miso soup, rice, copious amounts of shredded cabbage, pickles and veggies and fresh fruits. Rice and cabbage is unlimited, so you can ask for as much as you want. Two kinds of salad dressing are available on the table; a light soy-based vinaigrette and a thicker, sesame seed dressing. 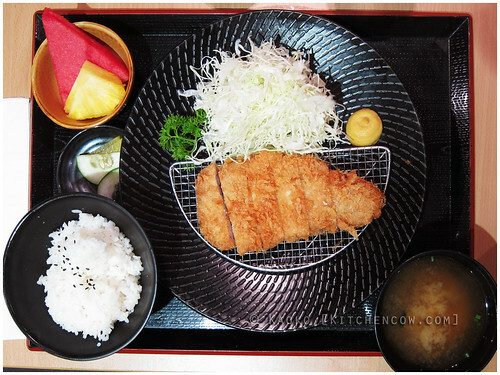 Aside from the set meals, you can also order katsu ala carte from their menu. These are smaller servings of various katsu, if you feel like just having a bite of the different kinds. Aside from pork, there’s a selection of seafood katsu like shrimp, creamy crab, scallop and oyster. 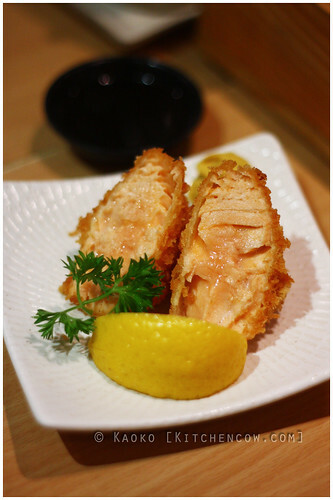 We tried one of their newer ones, a perfectly fried salmon katsu that was cooked just right; flaky on the outside, creamy medium on the inside. 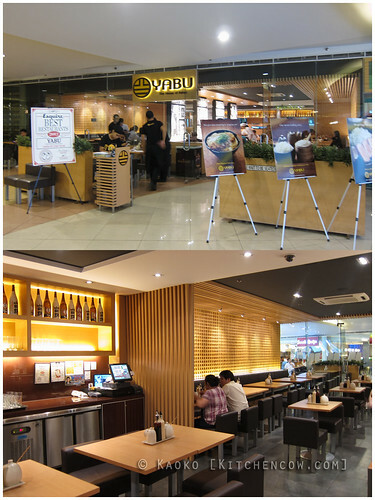 For a restaurant built on a single dish, Yabu excels, delivering quality, delicious food and good service. Be prepared to beat the lunch and dinner rush, or be prepared to wait if you plan on dining. Rest assured though, it will all be worth it. This review is based on a complimentary meal offered by Yabu management. No other compensation was received. Opinions are author’s own. That’s one very good reason to go to Megamall. Which of the two dressings do you like more? I have a hard time deciding between the two, I end up using both! Love, love Yabu! 😀 Have to go back for their new dishes. 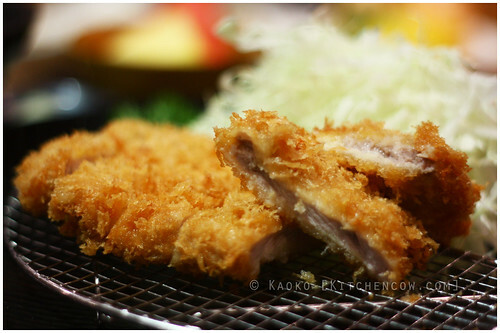 I don’t know if you tried it already, I also enjoyed the katsu at Tonkatsuya in Makati. Thank you so much for this awesome review! We hope you can come back again to try our other dishes. I must try this place soon! I’ve been hearing so much about it and the katsu looks awesome! It’s just far from me…One of these days! I have tried a similar restaurant, for me it a more reasonable price and they got also a unlimited rice. have you heard katsu cafe?